We’d love your help. Let us know what’s wrong with this preview of Hoke by Vivien Braslau. Settled into a life of power and influence, Hoke Brennan is one of the most respected men in the country. He's a good man who has it all. Hoke also has a target on his back. For years, a team of deadly foreign operatives has been watching him, manipulating his circumstances to achieve their own goals. Now they’re ready to set their plans in motion. Hoke won’t see them c Settled into a life of power and influence, Hoke Brennan is one of the most respected men in the country. He's a good man who has it all. Hoke won’t see them coming. He’ll trust the wrong people. And when his enemies strike, they’ll test him in every way imaginable. Giving in will risk the security of the United States, fighting back will cost even more. What’s a good man to do? To ask other readers questions about Hoke, please sign up. Thank you Goodreads giveaways for a free copy of this book! 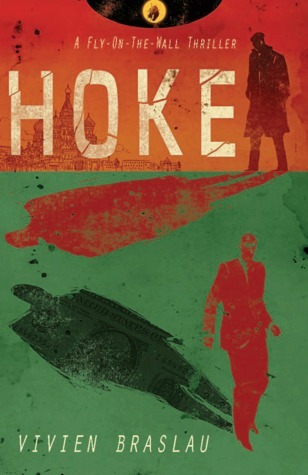 Hoke is a well developed, exciting thriller. It has to do with politics and finance (I won't say more, upon request from the author by a note at the end of the book), and Braslau does a good job of educating the ignorants like me, while keeping those in the know still entertained. The plot is the sell for this book. It slowly picks up and snowballs into an exciting what-will-happen-next and what-will-he-decide-to-do in a steadily increas Thank you Goodreads giveaways for a free copy of this book! Hoke is a well developed, exciting thriller. It has to do with politics and finance (I won't say more, upon request from the author by a note at the end of the book), and Braslau does a good job of educating the ignorants like me, while keeping those in the know still entertained. The plot is the sell for this book. It slowly picks up and snowballs into an exciting what-will-happen-next and what-will-he-decide-to-do in a steadily increasing pace. With that said, the writing could be better. The narration often tends to tell rather than show. At times, the attention to every movement of a character gives the narration a noir feel, while at others, it makes the read tedious and awkward. Some words are used in ways that made me raise an eyebrow; they seemed too strong or too mild for the situation being described (e.g., "Hoke stood woodenly..." a legitimate use of the word, but just does not work here.) And some character reactions are things that happen in films (like someone grabbing and holding the back of a chair because they are so upset, or [not in the book, but in films] crying as they slide down a wall onto the floor, etc. ), which stand awkwardly in the middle of seemingly realistic political, financial, and personal events. On the other hand, the one nightmare that Hoke has is so normal and realistic, it is hard to believe. Also, there is a lot of "looking up" in the book. He looks up at... and she looks up at... and everyone is looking up at something or someone. Perhaps too much description, again, a result of telling and not showing. Nevertheless, Hoke is a capturing read. It asks some fundamental questions about being human, being an adult with responsibilities that go beyond the physical boundaries of one's material existence, and the state of international affairs as a whole. (Received a copy through Goodreads First Reads) This book was pretty enjoyable! This story has an interesting plot - although the story starts out somewhat slowly, it quickly picks up speed. There are many twists and turns throughout the entire story, especially the ending (although I won't give anything away). The characters are all likable and easy to relate to. The relationships between the characters all seem very realistic and it's easy to imagine them as real people. Even the antagonists in (Received a copy through Goodreads First Reads) This book was pretty enjoyable! The characters are all likable and easy to relate to. The relationships between the characters all seem very realistic and it's easy to imagine them as real people. Even the antagonists in the story are somewhat likable - or at least aren't too repulsive. I'll be honest, I was a bit wary about reading a debut novel by someone I've never heard of as I'm usually fairly picky when choosing what to read. Overall, I was pretty well entertained and the quality of the writing is pretty solid - IMO better than a lot of books that end up being blockbusters like the Hunger Games series. Hoke starts out a bit slow but as you read on the plot starts to develop pretty nicely with some surprising twists. Definitely interested in reading the next installation. Reviewed for Readers’ Favorite (at ReadersFavorite.com). At the author’s request, this review does not reveal the main character’s vocation or the story’s key plot points. The thriller, Hoke, by Vivien Braslau, opens with Hoke and his lovely wife, Maria, who are visiting with Hoke’s best friend, Bobby, at Bobby’s estate. Hoke and Bobby have known one another since they were just boys, but ultimately the two made very different lives for themselves. While Bobby pursued riches and the power that go Reviewed for Readers’ Favorite (at ReadersFavorite.com). The thriller, Hoke, by Vivien Braslau, opens with Hoke and his lovely wife, Maria, who are visiting with Hoke’s best friend, Bobby, at Bobby’s estate. Hoke and Bobby have known one another since they were just boys, but ultimately the two made very different lives for themselves. While Bobby pursued riches and the power that goes with what money can buy, Hoke pursued a uniquely different path to power. Recently, Hoke suffered a heart issue, leaving those around him concerned for his welfare. But Hoke, ever the storyteller and center of attention, brushes off those concerns. He could not know, when surrounded by family and friends that his position has opened him to being compromised by those who would seek to damage all that Hoke loves. So, when Hoke finds himself in a bind, trying to provide the things for Maria that so very few (like Bobby) are ever able to possess, Hoke puts everything on the line. Will he be able to back away before ruining himself, his career and reputation, and his family? Readers are held spellbound to find out just that. Braslau’s Hoke, which provides readers a glimpse into the lives of the powerful and influential, is a suspense thriller that will keep readers asking for more. When Hoke experiences troubled times, readers will feel Hoke’s fear and depression. When Hoke is faced with potential calamity, readers will urge Hoke to ask for help. When Hoke reaches in one direction, readers will want to steer him in another, then will cringe in anticipation of the price Hoke will likely pay if he should make the wrong decision. Braslau tells a genuine tale of how difficult it can be for someone to admit failure and ask for help—how urgent is the sense of need to save face. Along the way, readers' hearts will trip a little faster as the noose tightens and, just when Hoke thinks the pressure has been released, will jitter with anticipation of what is to come. Braslau has provided thriller lovers with an entertaining, well-researched, read! I won a copy on Goodreads Firstreads. The author added the following note at the end of the book. "The author requests that readers who post rpositive or negative reviews refrain from giving away the plot of the book so that readers can discover Hoke's profession, the many twists and turns and ending of the story." I tried to come up with a review that would honor the author's wish. Unfortunately as soon as I started to say why I liked or disliked something, I felt i was giving soemthing away. Eith I won a copy on Goodreads Firstreads. I tried to come up with a review that would honor the author's wish. Unfortunately as soon as I started to say why I liked or disliked something, I felt i was giving soemthing away. Either that or I was so vague, that it wasn't worth saying. So here is my review. This is the first book of a new series called A Fly-On-The-Wall Thriller. It was well written with well-developed characters. I doubt I will read the following volumes of the series without seeing a review that makes me feel it wiil expand on the parts I liked and backs away from the parts I didn't like. On a personal note, I can not see how knowing Hoke's profession would hurt. Anyone going to the second book of the series will be familiar with the characters. Also knowing his profession helps to target the book to the right audience. Everyone knows James Bond is a spy, so if you like spy novels you will be more likely to read it then if you don't like spy novels. If you pick up a John Grisham novel, you can bet you will have a lawyer and be reading a legal thriller. In fact most people would be upset(and end up not liking) any Danielle Steel book that they were expecting to be a romance that ended up being a sci-fi epic. Received this from Goodreads giveaway. It is a well-written thriller with a good plot and characters that are fleshed out and relatable. The beginning starts slow, but after you get a few chapters in, it begins to pick up speed (it can easily be read in a single sitting once you dive into it). The tension builds as you gradually learn about the characters, their fears, their moral code, etc. I started reading this story in hopes of it getting better. And it grew a little but just never did take off and make a great story. It was an okay book but could have been better. I received this book for free from Goodreads First Reads. he puts his family life into the book it will be interesting on what the book is about. I will be finishing this book when I get more time this is not my type of book so my family will read it. I loved that the author autographed it directly to me. "For Sheila good reading Vivian Braslau." I read 5 or 6 chapters and could not get into the story nor was I interested in the characters. I received the book for free through Goodreads First Reads. VIVIEN BRASLAU grew up in South Texas and attended the University of Texas and Bard College. She has worked at a variety of jobs, including academic and political research, and spent time in New York and Washington, D.C. She lives and works in Austin, Texas.